Happy 90th Birthday, Dr. Hirsch! On Thursday, March 22, we celebrate the 90th birthday of the founder of Core Knowledge, E. D. Hirsch, Jr. Please join us (and the students at Urban Pathways School in Pittsburgh) in wishing Dr. Hirsch Happy Birthday!—and feel free to share your good wishes in the comments section below. “Don,” as he is fondly called here at the Foundation, remains a vital and consistent voice of reason, consistently affirming the need for a coherent, sequential, knowledge-rich curriculum as the key to educational equity and excellence. In 2014, the Thomas B. Fordham Foundation paid tribute to the far-reaching power of Don’s ideas in a collection titled Knowledge at the Core. You can read a selection of Don’s shorter writings here on the Core Knowledge website. Here at the Foundation, we’re ever grateful for the intellectual leadership Don has provided, and we’re looking forward to new insights and inspiration to come. To mark this 90th birthday milestone, we’re going to look back at one of the earliest signposts on the long and winding road to where we are today. We’re going all the way back to an article published in 1983, in the journal The American Scholar. The article was written before the movement became known as Core Knowledge and speaks instead about the concept identified in the article’s title—“Cultural Literacy.” As you’ll see in these excerpts, more than three decades ago the seeds were planted that have since flowered in the many publications of the Core Knowledge Foundation and the network of Core Knowledge schools. HAPPY BIRTHDAY! Thank you for all you’ve done! What a well-lived life! What a legacy! Your life’s work has made all the difference in the lives of countless people- students, teachers, families, and administrators alike- and will continue to do so for generations to come. Bless you, dear man, and happy birthday. You’re my Education hero. Happy Birthday! Thanks for having the courage and tenacity to make a positive change! Thank you so much for your work, Dr. Hirsch! We use the sequence here at our little private school as a spiraling curriculum for all our grades, and I find the work balanced and fascinating. Happy birthday! Thank you for your tireless efforts to promote the importance of knowledge as the key to our children’s education. Both as parent and as a teacher, I appreciate you. Happy Birthday! Happy birthday, Dr. Hirsch! May you have a wonderful year to come! Dear Dr. Hirsch. Happy Birthday from Las Vegas, NV. We are thankful for your contributions and dedication to education and cultural literacy. Our students, at St. Gabriel Catholic School, love learning and exploring daily. Happy Birthday, Dr. Hirsch! I wish you many, many more. Dear Dr. Hirsch — I wish for you the happiest of birthdays! Thank you for your hard work and perseverance. You are one of my heroes. Happy Birthday Dr. Hirsch and thank you for all your efforts, you truly have made a difference in this world. When I read Cultural Literacy back in the 80s, I had no idea I would one day be leading a school that uses a curriculum based on your work. I deeply appreciate your insight into the problems in education in the U.S., your vision and understanding about how to fix them, and your drive and passion to provide solutions. You have made such a difference in so many lives. Thank you so much for all you have done to start and sustain this movement. Happy Birthday, Dr. Hirsch! Happy Birthday Don! I hope you know that while it has taken America an inexcusably long time, your extraordinary work, and the courage and intellect that made it possible, are now having a major impact in states and districts across the country. We at the Institute for Education Policy at Johns Hopkins University are honored to nurture and expand the reach of your arguments and convictions. It is the best way we know to celebrate your truly remarkable journey – a journey that has changed American education, and will do so every more deeply in the future. You and your curriculum have had a huge impact on 15 years of Sand Ridge Charter School students here in Lebanon, Oregon! Thank you so much for everything! Wishing you a Happy 90th Birthday, Your influence and work has changed the way thousands of educators approach and implement curriculum. I will be forever grateful and honored to have been involved with the Core Knowledge Foundation and to call you my friend. Your lifelong commitment to what is best for all children has borne fruit many times over. It has been an honor to know you, my friend. Excelsior! Happy Birthday Dr. Hirsch! Your CK curriculum is outstanding ! Happy Birthday Dr. Hirsch! It was my distinct pleasure to meet you last spring at Lyles-Crouch Traditional Academy. I am a relatively new convert to Core Knowledge I am pleased to report that dozens of administrators in Oregon are now learning about you and your philosophy. Thank you from all your friends in Alexandria, VA. Happy Birthday, Dr. Hirsch. Thank you for all your contributions to education! Wishing you the very best 90th birthday, Dr. Hirsch. I believe that your Core Knowledge curriculum has been the single most important contribution to American education in decades! We at Old Town Academy Charter School in San Diego, CA proudly teach the CK Sequence. Happy Birthday! I love the Core Knowledge curriculum and only wish I had been taught it as a child! Thank you for this wonderful contribution to education! Happy Birthday Dr Hirsch! We appreciate the wonderful legacy you’ve left with all of your work, and the children of this country will be reaping the benefits for generations to come! Happy birthday Dr. Hirsch! You not only teach us how to be the best at educating our students, but how to live a meaningful, productive life! Cheers to you!! I had been in education for 29 years before I discovered your body of work. It revolutionized my teaching in my Kindergarten classroom, as well as the teaching (and learning!) of many of my colleagues. It just goes to show that you’re never too old or too experienced to learn something completely new! Thanks to you, I feel energized to teach until I’m…well…90! Thank you so much. Your life’s work has been a blessing to many teachers and parents, Dr. Hirsch! Your Core Knowledge series of books has enriched the lives of my students and my own children. I am particularly grateful for the insights I gained from the Learning to Read section of What Your Kindergartner Needs to Know (1st ed) – “balanced” information that has been surprisingly hard to find over the years. Thank you! Dr. Hirsch, Happy Birthday and many more. As the founder of Rocklin Academy, now three outstanding Core Knowledge schools, your pioneering work, the Core Knowledge Sequence and now CKLA has been the enduring foundation of our success. Dr. Hirsch – I’d like to echo the sentiments of my good friends and colleagues Cynthia Gadol, Stephanie Musser, and Joan Lange in wishing you an excellent birthday and to thank you for your outstanding legacy of championing equity through a content-rich curriculum! Happy Birthday! Although I do not know you personally, I am so grateful for you and your Core Knowledge Curriculum from which my students and my children have greatly benefited. Thank you, and best wishes from everyone here at George Washington Academy in St. George, Utah! Thank you for your work in creating a core curriculum that incorporates the classics, the western tradition, and supports cultural literacy. Your work has benefitted my school’s elementary programming immensely. Happy Birthday Don! It is a pleasure to know you and to have had the opportunity to work with you. I hope you have a wonderful day surrounded by family and friends! You remain my single greatest source of influence on education and education reform. Your life and professional contributions have been of great consequence to so many, including me. Thank you for your friendship and remarkable leadership on matters so profoundly meaningful to all! Wishing you a wonderful celebration of your birthday! All my best! Happy 90th Birthday Mr. Hirsch! Thank you for Core Knowledge and what it means to me and my students! The fact that I can sit down with THIRD GRADERS and discuss the fall of Ancient Rome, debate the heroism of Christopher Columbus, or begin to comprehend the enormity of our universe during the Astronomy domain never ceases to amaze me! I appreciate you and your team always expecting our nation’s young men and women to think and challenge themselves. While I am but one teacher in one classroom in rural North Carolina, I have no doubt that what my students learn will have a ripple effect in the future. As Matt Bevin says, “While it may seem small, the ripple effects of small things is extraordinary.” Happiest of days to you! Thank you so much for the invaluable Core Knowledge program that has helped so many students excel! Our school, Thomas Jefferson Classical Academy, would not be what it is today without you. Penblwydd hapus, Dr Hirsch, from your friends in Wales. Thank you for your commitment to helping teachers across the world to know about and understand how we can best help children to live successful and fulfilling lives. We, and they, are forever in your debt. Dr. Hirsch, I wish you a very HAPPY NEW YEAR and many more to come. This is Cristina Belmonte from Brazil, using Core Knowledge books and curriculum since 2003 and very happy with that. I found your web page Core Knowledge by chance. Thank you very much for all free resources!!! I am working in a poor school in Malaysia and appreciate your life work! Education is freedom and liberty! Happy Birthday, Dr. Hirsch! Thank you for your tireless work and publishings. I am grateful to have access to your online books at my school in China. Happy Birthday Dr. Hirsch! Thank you so very much for our Core Knowledge Curriculum. We started it at Three Oaks Elementary School all those years ago and I continue to love teaching it today. I appreciate the joy that I see it bring to students and teachers each day. Thank you from the bottom of my heart! Happy Birthday. The work that you have started has made a huge impact in the lives of the students I teach and the lives of the teachers who teach those lessons. Thank you so much to making integrated learning a reality. It is both good for the social studies standards and for the English Language Arts standards. Thank you. You are really a global thinker! Thank you for making a hard job, much easier. Happy birthday. We’re so glad you came along! Dr. Don! I don’t think you know how much you’ve inspired me to be a literacy leader. One that is inspired by children and their learning. Thank you for helping me understand the importance of knowledge and it’s relation to literacy! Happy birthday Sir!!! I hope you have a wonderful birthday! I am a huge fan of your work and need to keep buying copies of your books because I keep giving them away. I have been using the Core Knowledge Curriculum to homeschool my son, also named Don, for about 4 years now, in addition to him attending HS locally. He is working on the 3rd Grade curriculum and I so appreciate that I can download the materials. He is 20, has autism and, unfortunately, his classrooms have never had the spiraling curriculum he needed for full reading comprehension. His situation is very similar to the underprivileged children you write so passionately about – though he is neither minority nor poor. My goal is to keep working with him as long as it takes to get his GED diploma – even if he’s 30. Thank you from the bottom of my heart for all your work and allowing me to share it. The years I spent using the Core Knowledge curriculum with my 2nd graders were by far, the most enjoyable of my career! I remember the excitement on their faces each time a new domain was revealed, and how disappointed they were each time we had to bid our topic farewell. Students in my classroom, and all around the world, have fallen in love with learning because they have been fortunate recipients of your contributions. You are an inspiration to every person who believes our children deserve the best education we can offer. Thank you for dedicating your life’s work to fighting for EVERY child’s right to a knowledge-rich education. I wish you the happiest of birthdays! God bless! Happy Birthday, Dr. Hirsch! I so appreciate what you’ve done! You and I have been communicating since 1990 when I was the second principal in the nation to implement Core Knowledge. I’ve since brought it to two other NYC schools with outstanding results. As you know, I began a charter school in 2001 and since 2008, serve as the superintendent of our network of seven schools. Of course, all seven use CK. We have three USDOE National Blue Ribbon Schools and all have repeatedly been recognized as NYS Reward Schools. As I frequently tell you, you have made all the difference and have saved thousands of lives through your curriculum!!! Wishing you the happiest of birthdays in good health, with the utmost respect and gratitude. Dr. Hirsch, I was a graduate student in English at UVa when you were chair of the department. I warmly remember you were a kind and caring person then. I have watched with great gratification as your career turned into something worthwhile and laudable. I join the many, many people who have been enlightened by your work and energy and wish you all the best. Thank you for inspiring education and educators everywhere, Dr. Hirsch. Have a wonderful birthday celebration! Our Kindergarten and first grade students LOVE your program! They enjoy the skills stories so much, they can’t wait until the next lesson. They also love and learn so much from the Listen and Learn lessons. We are amazed how well the program works with young children. We wish you a very, very happy and wonderful 90th birthday!!! From P.S. 14 (NYC) … Special Education Teacher Susan Landesman. Happy Birthday from Idaho! I have used the New York Common Core Curriculum with my students in rural Idaho. I appreciate the availability of a solid well organized (no fluff) curriculum that brings the world and “reading fluency” to my low economic – wonderfully challenging students. You will never know how far your work reaches but you need to know that students all over this country are going to be prepared for a better life than any generation before because of your insight in how students learn and what they need to know. Thank you so much I wish you the best of health for this coming decade! Happy birthday, Dr. Hirsch. I’ve been proud to represent Core Knowledge over the years — a client that does so much good in the world. Thank you for your contributions to education. Your work has made a difference in the lives of many students and families and will continue to do so. Thank you very much for your contribution to the improvement of education. Education for all but specially for those who live without the resources to become citizens of the world provided with those necessary tools to live in dignity. Thank you for making politicians and education stakeholders aware of the importance of all persons knowing about their past so that we can better face the future, but above all about the importance of the possession of knowledge as the only key to attain prosperity for all. Don, your work has influenced my career more than has any other single individual. It has been a privilege to play a small part in spreading the word about why Knowledge Matters – which you have so patiently (and compellingly) unveiled for us over all these years. Your work has been a brilliant light in K-8 education for the last three decades, and we cannot thank you enough for your profound insights and tenacity in advancing them. Your formulation of shared, sequenced, specific content knowledge and your concern for the fundamentals of a well-functioning democracy, have yielded enormous fruits and shine a light to a good future. Crossroads Academy is one of many schools that owes its existence to your efforts. Shine on, Don! Dare to be a hundred! Happy birthday, Dr. Hirsch! I remember traveling with you throughout the Delta delivering Core Knowledge materials to schools. Thank you for your leadership and commitment to education. Dr. Hirsch, congratulations on CKF’s success! By creating high-quality resources and providing them for free, you’ve helped countless schools across the country. Happy Birthday! – Peter Gault from Quill. It is said that a birthday is just the first day of another 365-day journey around the sun and you are about to enjoy your 90th. Enjoy the trip in good health & happiness! Your long journey and contributions to education have & continue to inspire and make a significant difference to so many throughout the world. Happy Birthday Dr. Hirsch !!! Thank you for sharing your vast amount of passion and knowledge with the entire world!! Your books are amazing! Happy birthday, Dr. Hirsch! May you have a wonderful day, Thank you for your contributions to education. Happy 90th Birthday Dr. Hirsch! I have worked for the Icahn schools for the past 14 years, which is where I was first introduced to your curriculum by Superintendent, Jeffrey Litt. Coming from teaching at schools with scripted programs, it was a breath of fresh air to work at a school with a real curriculum that provided an instructional common thread between grades. The Core Knowledge Foundation has produced amazing content and resources that keep students engaged and excited about learning. I’m particularly a fan of the African American Anthology: Grace Abounding and am anxiously awaiting a new edition. Wishing you many more birthdays to come!!! Happy Birthday, Dr. Hirsch! You are a gift to all of us. Thank you, thank you for your contributions to the education field. The opportunity you are offering students with the CKLA materials is changing lives for the better. May you enjoy many more productive and happy days! HAPPY 90TH BIRTHDAY, DR. HIRSCH!!! Thank you so much for the extraordinary impact you have had on Mountain View Core Knowledge School through your work on the Core Knowledge Sequenced Curriculum. Our staff has been able to educate PK-8th graders for the past 22 years and our students have excelled. Thank you for being a pioneer in the field of education! May your day be fun and your year blessed. Happy Birthday, You Wonderful Creature! I hope it’s the best yet, with many more to come! Happy Birthday, Dr. Hirsch! Thank you for all you have done for educators, students, and families. Happy 90th!! Thank you for coming to Three Oaks Elementary, Fort Myers, FL. You lit a fire under many of us, especially me. I loved sharing my experiences with my students. Teaching Core Knowledge literature and reading skills works especially in Kindergarten. I am very blessed to have met you. Thank you for all you have done for education. Happy birthday, Dr. Hirsch. Thank you for your commitment to educational equity for all students! Your influence has significantly impacted my life as both an educator and a parent. Using the Core Knowledge Sequence and CKLA with my second grade students reignited my passion for teaching. I am eternally grateful for your continued contributions to education and consider myself extremely blessed to work with others in an attempt to carry your mission forward. I wish you many, many more happy and healthy years! Education, as you espouse, is freedom which is the foundation of a free people. Thank you. Urban Pathways K5 College Charter School thanks you for providing us the knowledge and resources we need to help our students be Leaders Building Pathways for Success. We hope your birthday was as special as you are to us. Happy Birthday, Dr. Hirsch! Common Knowledge must be the “fountain of youth”, the longevity of life. Thank you for all you have done to further a better education system and consider myself a warrior among my peers to carry out your mission of educating our next generations. I, too, wish you many more happy and healthy years. Happy 90th Birthday! Congratulations on your 90th! Echoing so many others, you are a wonderful inspiration and mentor to us all. Your career’s work in the intellectual history of education, and, most urgently, education policy and reform remains the most supremely cogent in these fields. While others have been offering half-baked “answers” for decades, you are the shining light in the ed world who knows how to think through and pose the right *questions*! While it is hard to find much room for optimism about our nation’s public education system, you continue to offer us hope and to show us the way. You are, and will always be, my hero! On behalf of the governing board, teachers, staff, students and families, at Hirsch Academy in Scottsdale, Arizona, I want to thank you for your contributions to education and inspiration to our school. Happy 90th Birthday!! May your birthday be a reminder to all that a great mind and spirit was born on this day. Your life’s work has uplifted and changed many lives for the better. What a fabulous contribution you made to my and my (now adult) children’s lives. I used the What Your Child Needs to Know from 1-6th grades as homeschooler’s on a ranch 100 miles from San Antonio. I coupled your truly liberal arts curriculum with Howard Gardner’s evolving work from 1993 to now in my homeschool classroom. My student’s where I have later taken teacher training and taught in the public schools for 2003 til now tutoring fully in reading gave me the insight to dismiss learning for students that was not sequenced. What a gift you gave us all. My grown children know how to read, study, and ask questions along with follow-throughs in testing and writing where they were never intimidated by new information. Just keep on with your passionate work because we all have benefited from you insight and gifts. And give you peace.”’ Thank you for all you have done, thank you for all you continue to do thank you for being uniquely you!!! Happy Birthday Don! I hope you have at least 10 more years to see how your work has grown. The number of CKLA schools is expanding very likely far more than we know as there is almost no way to track all the schools using the free online version. I am sure however that there are easily MANY tens of thousands of students using CKLA at this point and it is growing. Though other programs emphasizing knowledge are clearly different together we are now easily in hundreds of thousands of elementary students learning more about the world than ever. As states enter new adoption cycles in the next 2,3 years this will be millions. Millions of elementary children learning about the world every day of the school year. There is Don a perhaps unintended outcome to all these knowledge-based programs. In every single one of the scores of schools I’ve been in or worked with teachers report that their weakest students are more involved than ever before. In a knowledge curriculum, the core texts have to be read by all as opposed to traditional programs where students are leveled and everyone rarely reads the same texts. I have seen teachers literally cry for joy when talking about this. Happy Birthday Dr. Hirsch from New Dimensions Charter School in Morganton, NC. Thank you for your hard work and dedication to education. A very happy birthday to an amazing educator and wonderful person. While we all want to make a difference, you changed the world! Your legacy lives on and you should be very proud of your achievements. I miss seeing you, Don, and send my love for a very happy day. With wishes for the happiest of celebrations on your 90th Birthday, Don! The work you have done has significantly impacted how we look at education, learning, understanding, meaning, and connection with the world of knowledge and experience. It has impacted lives of many within, and far beyond, the walls of schools, and will continue to do so. Involvement with Core Knowledge has positively effected my life in ways in which I never would have imagined when I first learned of the work of the Cultural Literacy Foundation over 30 years ago through Lindley’s work there with all of you. From serving as a K-8 National Consultant and Core Knowledge Licensed Professional, to participating significantly in opening the doors to Hirsch Academy in recognition of the importance of your vision, it has been my pleasure and honor to support your work over the last 17 years. And, it has been a gift to know you and your family, Don, and to have experienced the power of passion for a belief that we could do more for children and in our schools. Because of your work and dedication, we have, done more. Thank you! Happy Birthday, Don! Thank you for so many years of incredible service and contribution to the education of America’s children! Happy Birthday, Don! It was one of the greatest honors in my life to be a part of your work. Happy Birthday and well wishes for many more! May you have a very Happy Birthday. You are a champion of children everywhere and I am so happy for all the years I have known you and was able to be a part of the Core Knowledge Foundation. Many more Happy Birthdays to you. Happy Birthday! How grateful I am for the little seed of an idea that you nourished into a complete garden of educating. Happy Birthday Dr. Hirsch from all of us at Icahn Charter School 7. Your work has been the backbone of our organization and we owe much of our success to you! Thank you for pouring into the lives of our children. Happy birthday, Don! It has been such a pleasure to get to know you while working at the Foundation. You have inspired me many times and challenged me to consider things that are often taken for granted or unknown many others. I hope this birthday is a joyous day for you and your loved ones. Happy Birthday! Thank you for all you have done to help our youth receive a better education, and helping us homeschoolers in our journey of teaching our children and grandchildren, especially when we didn’t feel confident in what we were doing. You’ve been a blessing. Liberty Common Elementary School in Fort Collins, Colorado wishes you a happy birthday, Dr. Hirsch. We are so happy to be a part of this revolution in education. Thanks for your commitment to improving the education of our students. You are truly an amazing person. Keep up the great work! Wishing you a happy 90th birthday! Thank you for making learning meaningful, fun and engaging for all students. Our Three Oaks Elementary “Core babies” have since graduated from college and are making significant contributions all over the world. The happiest of birthdays to you! Your research has been making a difference in the lives of students around the country, especially where it is needed most. I have personally seen students achieve higher levels of reading and background knowledge in the South Bronx, Newark, and Washington Heights. Thank you for paving the way to better education! Happy birthday, Dr. Hirsch! Your work around background knowledge has enhanced our understanding of comprehension. I appreciate all the work you have done and continue to do. I have had the pleasure of hearing you speak and shaking your hand. You are a true inspiration! Happy birthday! My belated happy birthday greetings from Tel Aviv. In Hebrew, we say Kol ha kavod, all honors to you Don, not only for reaching this milestone but also for your grand intellectual adventure. At a time when I am often disappointed by the shallowness of so much of our political and academic discourse, your life’s work stands out as a beacon of integrity and courage in pursuit of the truth. Here’s another Hebrew expression — ad meah ve esrim, till 120. Thank you for empowering our district to spark a literacy revolution. Your work, along with your team, is changing the trajectory of our students’ lives. We love you in Sullivan County, Tennessee! Thank you for your passion and continual commitment to your principles. I discovered Core Knowledge History and Geography about 15 years into my teaching… and it refreshed and revitalized my teaching. I’m entering my 27th year of teaching next fall, and I know part of my longevity, and a great part of my enjoyment of teaching sixth graders history is due to your content, format, and focus. Thank you for your contribution to genuine, quality education. Though I am late, HAPPY BIRTHDAY! 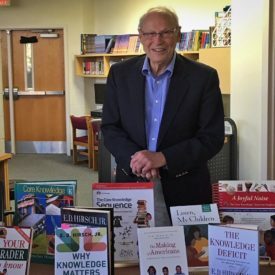 I am a retired teacher from APS in Georgia, who helped pioneer in Atlanta Public Schools CORE KNOWLEDGE, at a school called Capital View some years ago. The concept of a core of knowledge available country wide for age and grade levels, which was acquired from the knowledge of teachers, was such a wonderful and empowering concept, and it became the lifeblood and excitement of my successful teaching career until I retired from public education. My birthday was March 1st, and seeing that you got to 90, and still make a difference for children, inspires me to keep it moving. Yeah! On behalf of the students and staff of Concordia Charter School, Mesa, AZ, a belated but heartfelt Happy Birthday ! We thank you for your dedication and commitment and wish you many more years of good health and fortitude. Happy Birthday and thank you for your continual commitment to our youth. Your consistent work is what our young people need today. They also need someone to look up to, and because of your age and love for what you do can be very encouraging to all.